Denny Taylor and Catherine Dorsey Gaines made the first of what were to be many visits to families living in the inner city of a major metropolitan area in the Northeast. Their aim: to study the familial contexts in which young Black children living in urban poverty are growing up literate. Through their focus on children who were successfully learning to read and write despite extraordinary economic hardship, this multiracial team presents new images of the strengths of the family as educator and the ways in which the personal biographies and educative styles of families shape the literate experiences of children. Teaching without Testing revisits Taylor’s influential work based on her Biographic Literacy Profiles Project. Through detailed observations of student learning, Taylor encourages readers to consider alternative ways of assessing children’s reading and writing. Supporting a humanistic perspective to the education of children, Taylor argues that standardized and diagnostic methods of assessment and teaching, based on test-driven, cooperate-led accountability practices, have detrimental effects on children and result in the de-professionalization of teachers. In her attempt to find out more about literacy activities within the family context, Denny Taylor spent three years doing field work with six families. At the time of the study, each of the families contained a child who was considered by his or her parents to be successfully learning to read and write. This study attempts to develop systematic ways of looking at reading and writing as activities which have consequences in, and are affected by, family life. Family Storybook Reading provides vivid accounts of parents sharing storybooks with children. All kinds of families are represented with varied lifestyles, cultural backgrounds, and membership configurations. 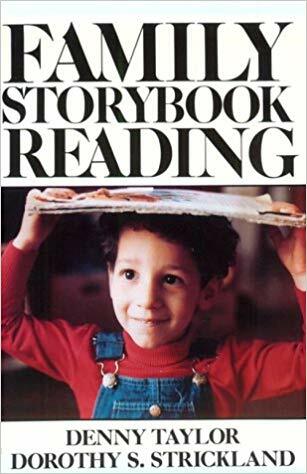 Through the descriptions and accompanying explanations the reader becomes acquainted with the special role that storybook reading plays in family life and in the acquisition of language and literacy skills. Learning Denied is a powerful document. Denny Taylor's conclusions confirm many teachers' doubts about America's mania for standardized tests, and serve as a signal to teachers and administrators that a reliance on test results can be more than misleading; it can be a hazard to the child. In an imaginary conversation at a Café in New York City 12 venerable women scholars outdo nine very rich dangerously misguided men of power. It is an allegory which combines scientific realism and comedy to set the stage in which twelve venerable women scholars expose the political nefarious practices, avarice, and greed behind the coup d’état – officially called the Whole System Global Education Revolution. At a time when family literacy policies and practices are confusingly fragmented and often deficit driven, Many Families, Many Literacies provides much-needed guidance on developing policies and practices that build on the strengths that families bring to any learning situation: their diverse languages, literacies, and complex problem-solving capabilities. Reading as a transactional process, reader-response, the ways texts teach, miscue analysis, kid watching, social responsibility and imagination, our existential existence. Yetta, Maxine, Louise, and Margaret speak about their lives and work, what makes teaching sublime. It is important that we read what they had to say and continue to learn from them. Exploring how literacy learning is enabled and disabled offers that opportunity. The teacher-researchers in this book use written texts to uncover the hidden assumptions that shape our perceptions about people's positions in society. They focus on how language is done, what we do with it, how we define ourselves in print, how students are defined-often reinvented-in obscure documents that control their lives. Teaching and Advocacy encourages teachers to stand beside their students, to expose the hidden assumptions in official documents, to develop alternative explanations, and above all, to advocate. This book presents the story of the political campaign that is taking place to change the minds of Americans about how young children learn to read. The book begins with a close look at the empirical research being used to support a massive shift in the national understandings about language, literacy, and learning and concludes by revealing the ways in which research studies on early reading instruction are being used by the federal and state governments to support a new methodology that has turned early reading instruction into a massive business of unprecedented commercial worth. Taylor's collection of related essays demonstrates the tremendous potential for real learning and real understanding when teachers sit side by side with their students and view the world from their perspective. "Official documentation" hides human rights violations in this country. Men, women, and children are incapacitated by legally sanctioned discriminatory practices that occur through the use of bureaucratic texts such as laws, court transcripts, medical reports, insurance policies, and work orders. Bureaucratic texts control the lives of men and women-Cindy, Sam, Laurie, Kathryn, people we pass on the street every day-living on the margins of American society. In Toxic Literacies, Denny Taylor explains how we allow this to happen and makes a compelling case for it to stop. What would it take to make Earth a child safe zone? Nineteen Clues makes the case that there are two threats to our children that impact every aspect of their present and future lives. The first threat to our children is the hostile take over the US public education system. The second threat to our children is the great acceleration in the changes taking place to the planet. “Humanity is standing at a moment in history when a Great Transformation is needed to respond to the immense threat to the Earth,” a group of Nobel Laureates writes in their summary of the 2007 Potsdam Memorandum on Global Sustainability. Bio-punk. Weird literature. A sci-fi fantasy that is frighteningly real. Split Second Solution is a dystopian urban novel set in New York City in 2022 that predicted the rise of Trump (the Ginger Tom) and anticipates his fall.At the beginning of Split, the Sick Reapers and A.I. have seized power and captured Word. To escape being raped and killed, Word jumps into the Hudson River and Death splits the last second of her life to save her. And, it is in the last split second of Word’s life that the entire story is told. Rosie’s Umbrella is about love and loss, forgetting and remembering, losing one’s self and becoming someone you never knew or imagined being. We meet 14-year-old Rosie Llywelyn in Boston in 1995 at the moment her life is changed forever by a tragedy that occurred in a coalmining village in Wales in 1955. From the very first page the reader experiences the emotional turmoil Rosie feels as she tries to find out what has happened to her Aunt Sarah and why her parents won’t tell her why they have had Sarah committed to a psychiatric unit in a nearby hospital. Rat-a-tat-tat! I’ve Lost My Cat! is a picture story book written by renowned literacy scholar Denny Taylor to entertain and be great fun for children learning to read. When read aloud the story hums, and the rhythm of the highly predictable text makes it easy for children to read. The paintings of the charismatic characters and the irresistible cats are bold and brilliantly painted by the acclaimed conceptual artist, Shelton Walsmith. Toodle-oo is a touching story about two little girls – Ruby Blue and Lilly Wu – saying goodbye to each other. Part poem, part song – the words rhyme as Ruby Blue and Lilly Wu remember playing together. Destined to be a beloved classic, Toodle-oo is highly predictable and easy to read. Both children and adults already love it.